The 70's hair kit is perfect for creating the cliché hair styles of the 1970's. 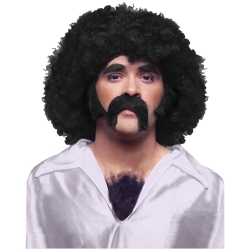 While the afro wig pictured is not included it makes a great finishing touch. Even if you decided no to use an afro this kit will still work with almost any hair style. The 70's hair kit includes a moustache, a pair of side burns, and a hairy chest. All items are self-adhesive. Additional adhesive is available for multiple applications.